Raised Beds – At Last! Would you believe it? We have three beautiful raised beds in our expanding Kitchen Garden. All filled up with, (from the bottom upwards), bits of brick and stones for drainage, old cardboard boxes opened up from deliveries, our amazing homemade compost, and shop-bought compost mixed with top soil and a bit of fine grit. Full to the top! And how I love them. This is all the more amazing because, as some of you may know, I have been undergoing chemotherapy and suchlike, but hopefully I am ‘on the mend’. Erik worked really hard to make me the raised beds, to encourage me back to work. He knew how frustrated I had become, putting so many plans for both the house and garden on hold for this year. But now I feel fit as a fiddle, and have been getting busy with the Kitchen Garden, trying to catch up on all those wasted months. One of us came up with the brilliant (?) idea of a competition to see who could fill up a raised bed in the quickest time, so we shovelled and sweated, then shovelled some more, and I think, in the end, it was a draw. 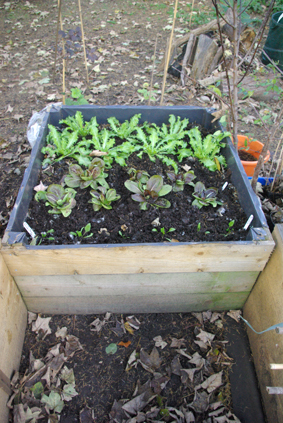 This Salad raised bed, above, is the smallest bed we have created so far. It is 4 foot x 4 foot, and is in the shadiest spot of the Kitchen Garden, so is great for some salad varieties, as certain plants will bolt and go to seed if they are in too sunnier a spot. In this bed, I have sown (at the front) tiny Spinach Bordeaux. These will each grow to large plants if I let them, with dart shaped green leaves edged in scarlet. But I like to keep them smallish, and use the leaves mixed in with other lettuce-type varieties. We also have rows of Endive Pancalieri and rows of Chicory Varieagata die Castelfranco, which will hopefully winter well for a while. This next bed, below, is 6 foot x 4 foot, A good size for a raised bed – you have to be able to reach the middle easily so that you can plant and weed without damaging the soil. As you can imagine, I was desperate to get back to growing our own vegetables etc., and chose what I hoped would grow for us this winter and into next year. So this raised bed is the home to the Kale family, in the shape of Cavolo Nero, the dark green Tuscan Kale, which I love to cook in creamy Gratins, make the mouth-watering, classic soup, Ribollita, or stir-fry in shredded strips with oil, a pinch of chopped up red chilli and finished off with a knob of good butter and black pepper. Making myself hungry now! I bet you’re thinking “It doesn’t look very impressive – a few straggly plants and labels!” You just wait a few weeks – this raised bed will be overflowing with huge, handsome Cavolo Nero plants – strong leaves in the darkest green and reminiscent, I always think, of the Prince of Wales feathers. Redbor will be so curly and pink, very ‘girly’. 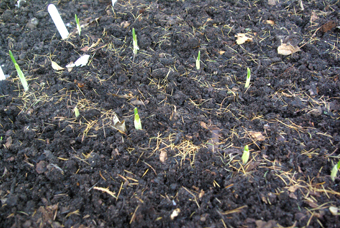 And the Garlic will gradually grow into a tall, straight spiky ‘cane’, the bulb filling out under the soil. I do love growing Cavolo Nero, because it is an incredibly handsome plant. It would look brilliant in a biggish tub, as an architectural plant, if you don’t have much room. I grew it in my old kitchen garden, and loved both the look and the taste of it. See below. 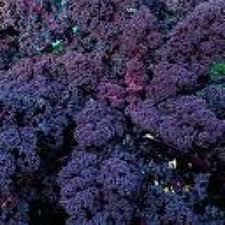 The other Kale, in between the Cavolo Nero, is Redbor, a pinky-purple Kale. Kale is so good for us, full of strong vitamins and minerals, and should be on everyone’s ‘to grow’ list. If you want to see recipes and more information about Kale, either put in ‘Cavolo Nero’ or Kale in our search button or click on this. For me, an important part of realising that I have been so lucky this year, in hopefully beating the big ‘C’, was to tell myself that life goes on as normal. And for me, normal in Autumn is getting soil under my fingertips, getting really grubby and planting my culinary Garlic. So that is what is growing in the raised bed with the Kale. Not the perfect place, but when we have more raised beds, the Garlic will have more space. At least it will get any sun we happen to have this winter, and will be poised to get a lot of sun in the spring and summer of 2015 (heavens, where has this last year gone?). I always buy my Garlic from The Garlic Farm on the Isle of Wight. Click on the name to go and have a look. 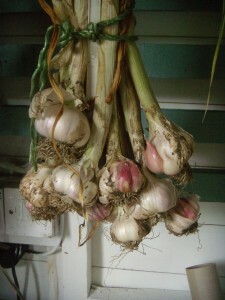 I chose (obviously) to buy the Garlic to plant this autumn, mainly Garlic of the Hardneck varieties. These varieties should be ready to harvest at the end of June, next summer. Garlic needs a good, rich soil, and as much sun as possible. 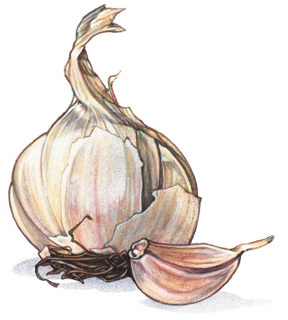 You should break up the big garlic bulb into the separate cloves only 24 hours before planting, trying not to bruise or damage them. The cloves need to be an inch and a half (3-4cm) below the surface of the soil, the roots at the bottom, the pointy tip at the top, and approximately 6 inches (14/15cm) apart. Garlic needs regular watering during the growing season, and also likes a feed every so often, and hates being surrounded by those dreaded weeds. The Garlic Farm recommends giving the cloves sulphate of potash in February which supplies all the nutrients necessary for the Garlic growth. Stop watering completely during the last few weeks before harvesting. For Hardneck Garlics, when the leaves start to change colour in Summer, they are ready to harvest. 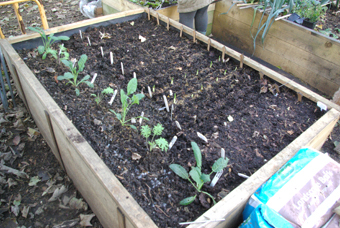 Lift them carefully out of the soil and lay on netting or somewhere dry in the sun – greenhouse or shed if it’s raining. Leave for a few days. I chose a new variety, Red Donetsk, from the troubled Ukraine – it is suitable for a northern climate. Also another variety new to me, Red Duke Wight, which is a ‘rare ancient hard neck from Bohemia – one of the strongest and hottest garlic types in the world’. Beware if we invite you to a meal in summer – you may get some of this! Apparently Red Duke Wight is ‘widely used for its medicinal properties, cleaning wounds and facial sores. It is very powerful and can burn the skin’. Beginning to wonder if I made the right decision on this one! But it adds ‘makes for an exceptional garlic bread’, so there you are, it must be good. I will report on this one next summer. I also planted Chesnok Wight, Lautrec Wight and my favourite, just because of its historical name, Carcassonne. I love History, have an ancient connection with this part of France, and always have images of the brave Cathar warriors in medieval times galloping around the area, breath overloaded with their favourite garlic so potent that it would overpower their enemies within seconds. Back to the present. Two weeks ago I planted my garlic, and guess what? Within a week the tiny tips of the Carcassonne cloves had peeped through the soil – see below. This was the first bed Erik finished for me. I was going through very dark days this last summer, not being able to eat or drink much, and just literally falling asleep the instant I sat down on our squashy sofa. So Erik ordered a huge load of top soil from our friendly builders’ merchants, which they delivered and dumped on our driveway. Then he took it upon himself to barrow up and down our garden so many times. Our garden is about 300 foot long, the drive being at the front of the house, the Kitchen Garden area about 200 foot from the drive. So it was a real feat of strength, for him to fill up this bed on his own, bless him. As soon as it was filled up with the mix of drainage, cardboard, compost, top soil etc to my liking, I just had to grow some parsley – curly bright green and lots of flat-leaf parsley as well, at the far end. Then I went to a local Farmers’ Market and found some baby Leek plants, so those went in as well. I use my cardboard toilet roll holders and kitchen paper holders to protect the Leeks, and because of our pesky squirrels and pigeons, I used canes to keep the Leeks upright. They are doing very well, and I can’t wait to pull them up in a few weeks, and thus start the beginning of what will be our dream Kitchen Garden project – growing and eating lots and lots of our own food. Recently I was sorting out the soft fruit in the fruit cage, pruning, topping up with soil etc., tidying up the Strawberries – that sort of thing. 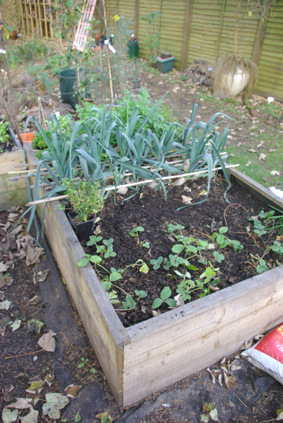 There were a few straggly Strawberry plants that needed extra space, and I decided to plant them in the spare soil in front of the Leeks. Then in spring I will pot them up and back into the fruit cage they will go, to protect the bright red soft fruits from the marauding birds (we love our Blackbirds and Robins really, but not when they eat our fruit). 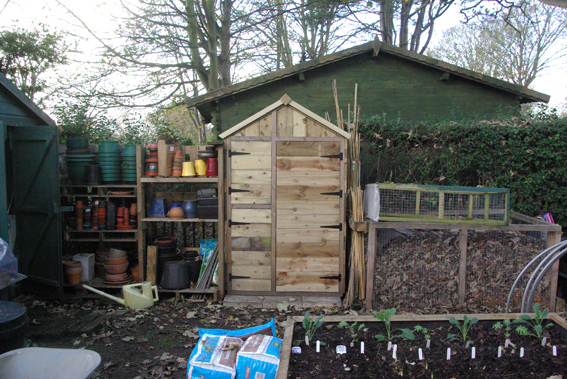 Heavens, I almost forgot to tell you about the wonderful shed that Erik has made me from the unwanted wooden slats that our neighbour was throwing out. This has been a real work of art, and hard work at that! Inside shelves, waterproofed against the elements and just perfect for me to fill up with all those boxes and tubs and sprays of garden products that either help growth of fruit and vegetables or kill off all the nasty weeds, thorns and parasitic plants. I did suggest that if he could make one this nice but tiny, how did he feel about making us an extension to the house? His reply could not be repeated in polite company! So, we are now the proud owners of 3 raised beds, a Fruit Cage filled with berries and soft fruit, and a mini-orchard, which I will be writing about soon. I also planted more Wild Garlic, on either side of the path as you enter the Kitchen Garden – an appropriate place for it to be, I think. A subtle hint or whiff of the Wild Garlic could be just what we need to kickstart our creative culinary juices next spring. I am really looking forward to 2015 now, thank goodness.